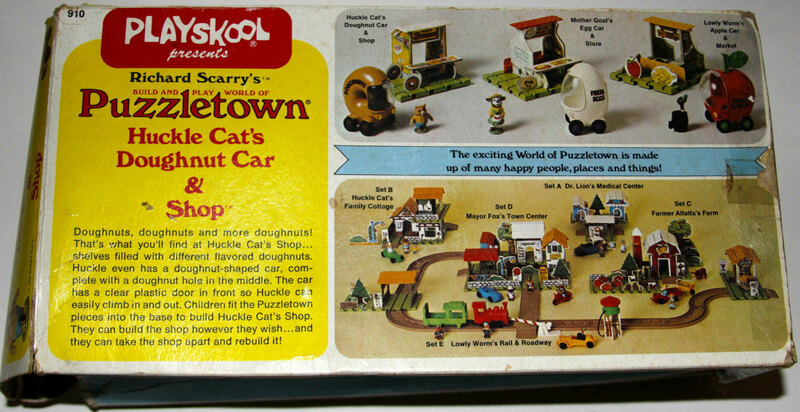 Huckle Cat's Doughnut Car & Shop is one of the 3 small Puzzletown sets. 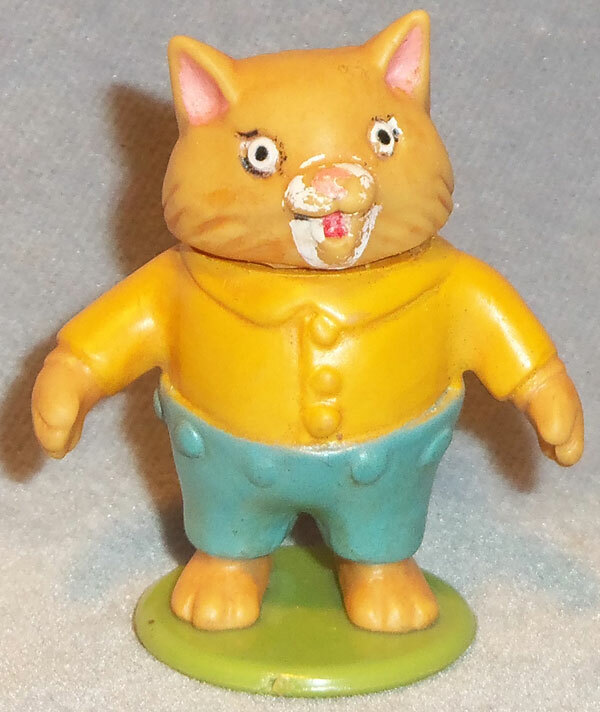 The set includes a small square puzzleboard, pieces to make a doughnut shop, doughnuts, a creative donut-shaped car, and a Huckle Cat figure. 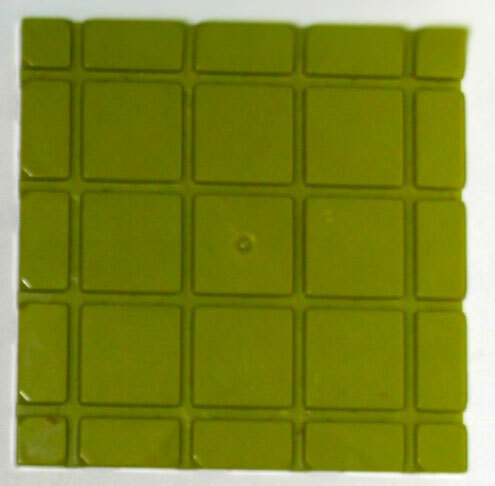 PSK313 - Playboard Base - Square green hard-plastic playboard base with raised squares creating grooved lines (furrow or "ditch") to support Decorated Woodboard (Puzzle) Pieces. Has 4 horizontal grooved lines and 4 vertical grooved lines. The outside edge squares have a small square hold in the bottom left corner (to attach road/ramp pieces). Measures 6" long x 6" wide x 3/8" tall. 3 each - PSK314 - Roof Piece - Short WHITE rectangular hard-plastic roof piece with rounded scalloped roof shingles molded on one side and a raised "grid" on the other side. The "grid" is one long line with 3 equally spaced + shapes. 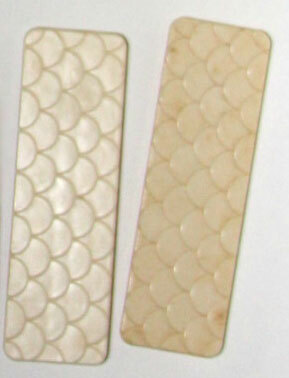 Measures 4-1/8" long x 1-3/8" wide x 3/8" thick. PSK315 - Yellow exterior with a "HELP WANTED" sign and a round brown donut-shaped sign marked, "Huckle Cat's Doughnuts". Orange interior with green shelves, lined with doughnuts. Measures 4-1/8" tall x 3-1/4" wide. PSK316 - Yellow exterior with a "FRESH DONUTS" sign. Orange interior with green shelves, lined with cooking utencils, recipes, bag of flour on floor and bucket of icing on a stool. Measures 4-1/8" tall x 3-1/4" wide. PSK317 - Donut Sign - Yellow rectangular sign with a doughnut, "HUCKLE'S" in black and "DOUGHNUTS" in red (same design on both sides). Measures 1-3/8" tall x 2-7/8" wide. PSK318 - Donut Shelf - Long orange rectangular wall with yellow tongs, green 2-shelf display with chocolate donuts and round red covered plate with multi-colored doughnuts (same design on both sides). Measures 1-3/8" tall x 5-3/4" wide. 2 each - PSK319 - Orange Donut - Round doughnut with orange glaze on top. 2 each - PSK320 - Pink Donut - Round doughnut with pink crumble topping on top. 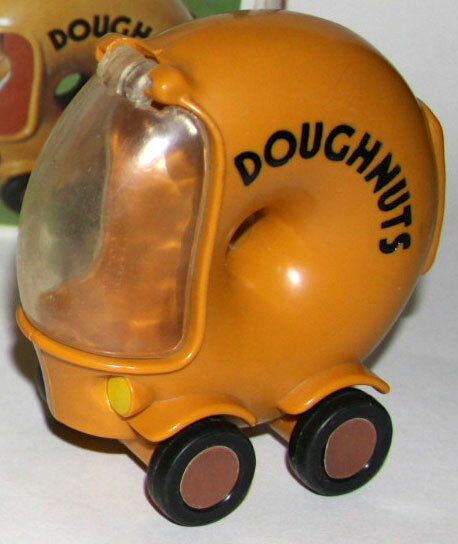 PSK321 - Doughnut Car - Round orange doughnut-shaped car that rolls on 4 black wheels and marked "DOUGHNUTS" in black on the side. The front has 2 yellow headlights and a removable door/windshield that lifts to allow play figure to fit inside. PSK322 - Door/Front Shield - Rounded clear plastic door/front shielf that fits onto the doughnut car. PSK323 - Complete Set in Original Box. 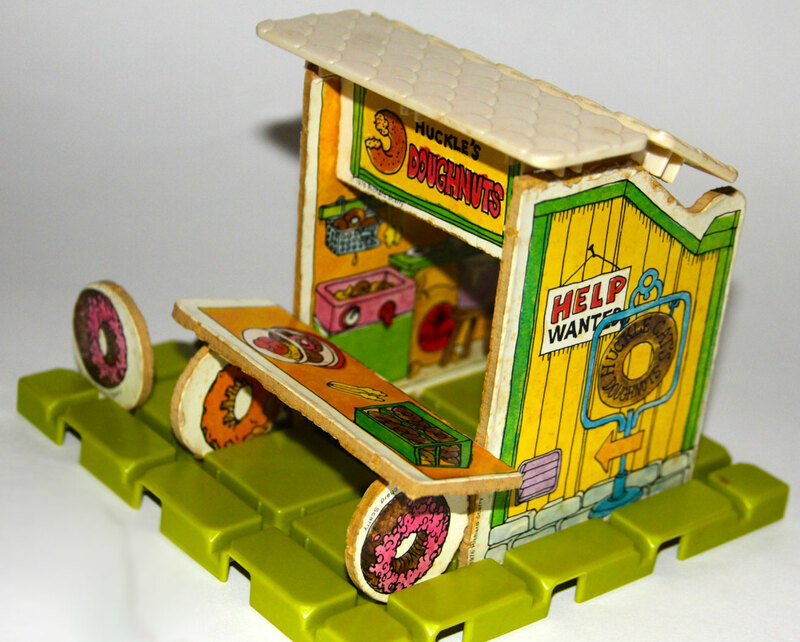 PSK324 - Box ONLY - Sold in a box marked "910 Puzzletown - Huckle Cat's Doughnut Car & Shop".